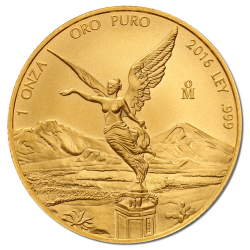 According to industry news, demand for the Mexican Libertad Gold Coin is growing at a faster rate than any other comparable world bullion coin. This makes the Libertad an excellent buy for investors as well as for collectors who are drawn to its iconic 'Winged Victory' design and its place in the history of Mexico. The Gold Libertad has been a popular option for decades and its famous statue design was first seen on Centenarios. Gold Libertad's were first produced by North America's oldest mint, the Casa de Moneda de Mexico, in 1981 with a finedess of 91,7 %. From 1991 on they have a millesimal fineness of 99.9%. Interestingly, the obverse of coins released prior to 1996 shows a front view of the winged Victoria statue on top of Mexico City's landmark Independence Victory Column while later coins show a side view.